We have a huge range of lecterns for sale, some that come with with built in microphones and speakers, some are are height adjustable & portable. We can also supply a lecturn with your company, school or organisations logo. These units are a sturdy reliable, selection of the most economical units. These exclude electrical connections. Many are flat packed for ease of interstate delivery. Lecterns & accessories for the Boardroom or school presentations. Lecterns in this section offer an executive presence with Microphone / Light sockets, optional clock and storage area. We can even incorporate room console control systems available and in some cases the option of a built in PA system. We can also co-ordinate a full boardroom fit out including Cordless Microphones, screens & projectors. This selection of Lecterns are the professionals' choice. Strong and attractively designed and constructed they are like "pieces of furniture". They represent the ultimate in practicality and function with many options that adds to their versatility. A specialised area with lecterns designed for all modern education institutions be it Primary, Secondary or Tertiary. Can also be utilised in any training situation. Whilst we are based in Melbourne we do supply to clients in Sydney, Melbourne, Brisbane, Perth, Adelaide, Canberra, Hobart & Darwin and all towns and cities in between. So, no matter your location, we can help! 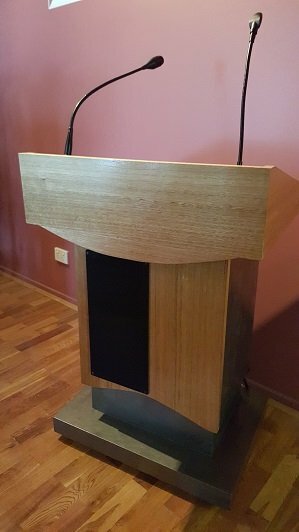 If you want to buy lecterns, to make an inquiry regarding our Lecterns for sale or for purchase, please feel free to contact us either by telephone (on 0418 574 767 or in Victoria on (03) 8420 7788), email or by using our Inquiry/Booking Form. We will endeavour to respond to your email or Inquiry Form submission within 24 business hours. As our available products change regularly, it is not possible for us to list every Lectern we have for purchase on this site. If you cannot find the Lectern you are looking for, please feel free to call us (on 0418 574 767 or in Victoria on (03) 8420 7788), email us or use our Inquiry/Booking Form to make an inquiry. We will endeavour to respond to your inquiry within 24 business hours. Want to Hire a Lectern or Lecturn? We also hire Lecterns. Please feel free to call us (on 0418 574 767 or in Victoria on (03) 8420 7788), email us or use our Inquiry Form to make a Lectern hire or purchase inquiry. We will endeavour to respond to your inquiry within 24 business hours.